Schießstätte Allach is located on the bicycle route along the river Würm between Pasing and Dachau. Schießstätte translates directly to “shooting range” as the beer garden once belonged to the “Königlich Privilegierter Feuerschützenverein” (Royal Privileged Marksmen Club). The Kaltenberg brewery opened the beer garden to the public with a new leaseholder in recent years. There are about 500 seats in the self-serviced area. Most of the beer benches and tables are old-style fixed to the ground. Unfortunately, not all tables are shaded by trees. The Kaltenberg Hell or Dunkel costs € 6.00 p/Maß (June 2012). On less busy days the self-service food and beer stands are closed and a waitress will bring the beverages from the restaurant. The restaurant adjoined to the beer garden is over 100 years old and is located next to a sports complex. 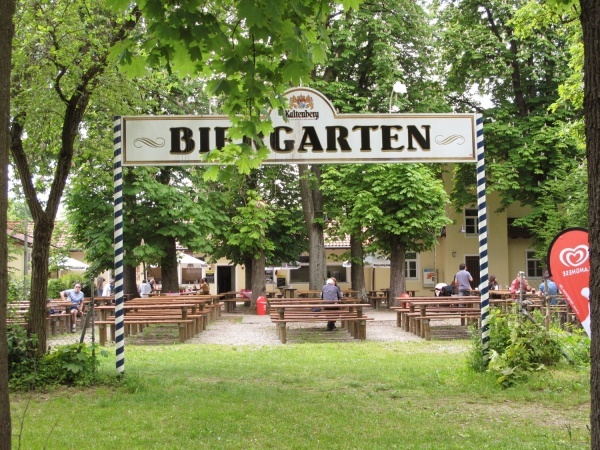 Not too many cyclists are aware of this nice beer garden as a potential stop-by en-route Dachau. The beer garden is open when the weather is good during the summer months from 11am until it is too cold or when the last guests have left. A History of Schießstätte In German language. This page was last modified on 18 May 2018, at 19:19.